Born in the bluegrass state of Kentucky, Edward Anderson “Ted” Flowers was raised on Hollywood westerns with their romanticized cowboys like Tom Mix, Buck Jones, Ken Maynard, Gene Autry and Roy Rogers -- always restoring order, correcting a wrong, or saving the fair-haired maiden while, inevitably, riding off into the sunset on a gorgeous (but highly impractical) silver mounted saddle. Flowers marveled at the beauty of those sterling silver Rose Parade style saddles made by California’s iconic makers like Hollywood’s Edward H. Bohlin and San Francisco’s Visalia Stock Saddle Company, but felt that the exorbitant prices precluded a large percentage of potential parade participants from acquiring such an equestrian treasure. 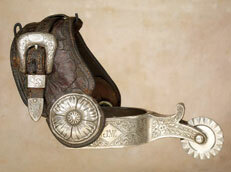 Consequently, Flowers decided to create more affordable and much lighter parade saddles adorned with German silver or monel ornamentation at a fraction of the cost of the legendary west coast saddleries. Thus, in the mid-1940s, was born the “Spot Shop” in Alexandria, Indiana -- on route 9, mid-way between Anderson and Alexandria, where “everyman” could afford to ride in style like a cowboy hero at a fraction of the cost. In the beginning, Ted used pre-existing LV Frazier (Indiana) black, floral carved leather saddles and just adding his own silver mountings. However, eventually Frazier went out of business and Flowers began manufacturing his own saddles while creating dies to produce silver components for his fancy ensembles. Flowers was considered a good craftsman and excellent marketer in his field who prospered well into the 1960s. However, his life ended tragically when he allegedly shot and killed Kenneth Goad, 24, and Sherry Gross, 30, at his Alexandria home on Aug. 21,1975. He was charged with two counts of first degree murder in connection with the shooting deaths of the two Muncie residents. While awaiting a January court appearance, the 61-year-old Flowers collapsed at the Madison County Jail where he was being held and passed away on Jan. 7, 1976 at Saint John’s Hospital of an apparent heart attack. Ted Flowers was laid to rest at Park View Cemetery in Alexandria.